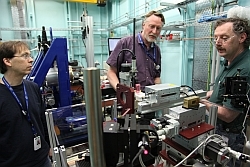 A collaborative research team from Melbourne has performed the first radiotherapy experiments on the Australian Synchrotron’s imaging and medical beamline. The team is investigating an experimental form of radiotherapy for cancer treatment called microbeam radiation therapy (MRT). The technique treats tumours with narrow wafers of very high doses of synchrotron radiation delivered in a very short time. This is not feasible with conventional radiotherapy x-ray machines in hospitals. Research using synchrotron-generated microbeams for cancer treatment is still in the experimental stage, but researchers believe MRT will improve our understanding of how radiotherapy works, leading to more effective treatments for cancer. Animal studies have shown that this form of radiation is remarkably well tolerated by normal tissue, but can destroy entire tumours. However, the fundamental biology of MRT remains a mystery. The Melbourne team is investigating how MRT ‘works’ on a cellular and molecular level – and how it compares with conventional radiotherapy in terms of controlling tumour growth and minimising damage to normal, healthy tissue. In November 2009, the team used MRT at the Australian Synchrotron to treat laboratory mice with malignant tumours on their legs. The mice were then returned to the animal house for monitoring. The study, which was fully compliant with strict animal ethics requirements, found MRT significantly reduced tumour growth compared to untreated control tumours – with minimal side effects to normal tissue. The collaborative MRT research team is led by Monash University scientists and includes researchers from Peter MacCallum Cancer Centre, The Alfred Hospital, CSIRO and the Australian Synchrotron. 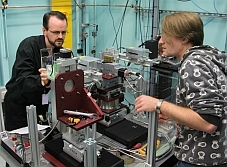 The team is already planning its next MRT experiments on the synchrotron’s imaging and medical beamline, which is one of only four facilities around the world that can do MRT studies. Preparing for the synchrotron’s first microbeam radiotherapy experiments. LH photo, L-R: Carl Sprung (Monash University), Chris Hall (AS) and Andrew Stephenson (CSIRO). RH photo, L-R: Jeff Crosbie and Simon Higgins from Monash University. Photos courtesy of Peter Rogers.